Learn how to make a cute origami mouse! These origami mice can be made into different poses – sitting up or flat! They are quite three dimensional and easy to make! I love these little origami mice! It’s a modification of the traditional origami mouse. Instead of the mouse just being one color, the head and tail can be a different colour. The Pose is also different. They can be sitting up and flat to the ground like they are sleeping or moving! 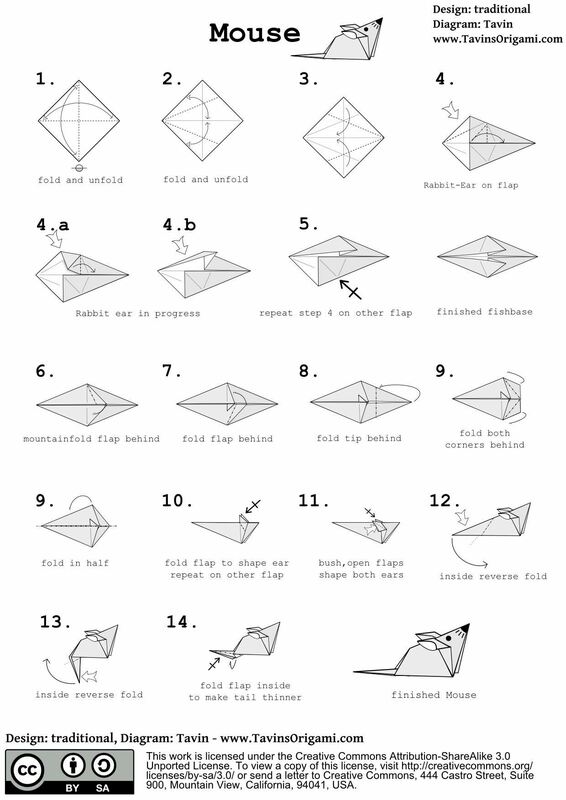 People often ask how do you make your own origami designs? You can start with a traditional model, modify it. That’s a great way to start making your own designs. Once you have your modification, you can modify it again and again, maybe even making it into a completely different thing altogether. That is probably the only way to start, after you’ve done that a few times, you can start creating things from scratch, often starting with one of the origami bases. Example size: 17 x 17 cm | Final result: about 12 x 7 cm.  A Photo Tutorial (of the traditional mouse) is available on the Origami Photo Tutorials page.